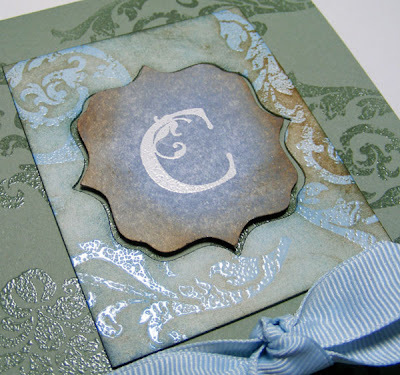 One thing I had not tried before was to apply distressing ink colors to a paper, then stamp and emboss a clear image. Afterwards, apply more distressing ink. 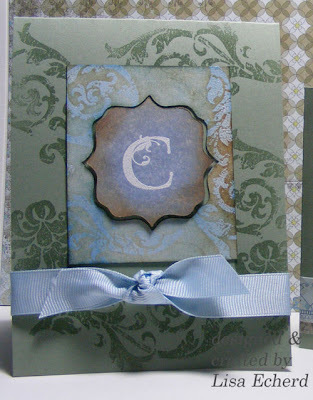 The clear stamped image will show the original color through. That's the technique I did on the frames above and I love it!!! 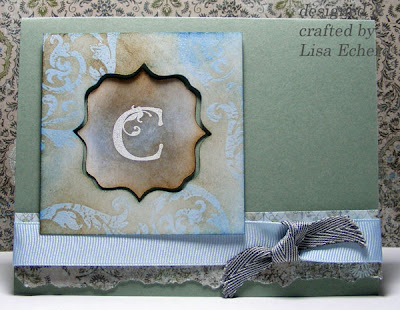 These cards were a great way to use some cool stuff I had on hand and out for other projects. The pointed square cuts and frames were left from the coasters I did this week. I cut some frames the wrong size so I had these extra. The centers are what are left from the ones I cut the right size. 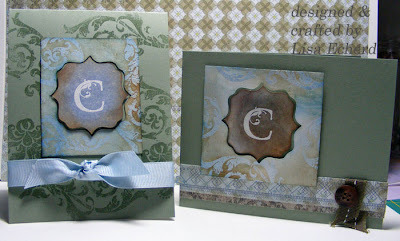 They were in just plain white cardstock but I hated to throw such pretty designs away. The designer paper is Basic Grey from their Perpiphery collection. I've had it out for some scrapbooking. I did pull the blue ribbon from my stash. It is a polka dot just turned so the white dots don't show. These are good colors for "C" these cards go to. I even had the Lovely Letters set still out. Now I have slightly less stuff to put away and some pretty note cards for one more customer appreciation gift. Ink: Versamark; Soft Suede, Not Quite Navy, Brocade Blue, Bordering Blue by SU!